Marriott International Inc. has re-affirmed its commitment of creating a wedding experience that is superlative and unforgettable in every way, from conception to execution. They have announced their biggest association of the year ‘Shaadi by Marriott’ with India’s leading designer duo Abu Jani Sandeep Khosla. Scheduled to be hosted on July 21st at the JW Marriott New Delhi Aerocity, the association will come alive through a power-packed fashion sequence, broken down into five parts to beautifully represent various wedding ceremonies - right from the cocktail and sangeet to the mehendi, ending with of course the grandest ceremony, the Shaadi. The Abu Jani Sandeep Khosla collection that will be launched in association with ‘Shaadi by Marriott’ is a scintillating mix of ranges that, together, spell absolute Fantasy. As expected from ‘Shaadi by Marriott’ and designers Abu Jani and Sandeep Khosla, this collection embodies the spirit of crafted luxury and attention to detail, that promises to make every bride feel pampered and indulged like never before. We spoke with Khushnooma Kapadia, Area Director of Marketing, South Asia, Marriott International, and she was happy to give us the inside scoop on what’s happening. Why did Marriott choose to associate with Abu Jani Sandeep Khosla for Shaadi by Marriott? KK: ‘Shaadi by Marriott’ curates and crafts personalized and unforgettable wedding experiences for their guests. It is our promise of faith, trust, quality and value to guests whilst delivering a wedding experience that is superlative in its offerings. Abu Jani Sandeep Khosla embody these brand values and brand ethos and hence, it was a seamless collaboration for us. For the first time ever, the notable designer duo has collaborated with the world’s largest hospitality chain to host the most breath-taking representation of the great Indian wedding. What is Shaadi by Marriott all about? KK: ‘Shaadi by Marriott’ was initiated with the intent of personalising a complete wedding experience, right from the perfect venue and décor to great food and hospitality. Whether it’s a Big Fat Indian Wedding or an intimate one, our goal is to provide you with the best of the best, all under one roof. Does SBM offer anything else? KK: Yes, we have another section called Honeymoon by Marriott where if you book your wedding at any Marriott hotel, they offer you a complimentary honeymoon vacation that’s on us. We pay for the honeymoon! Of course, there are terms and conditions involved. How amazing does that sound? Click here to know more. KK: Our (Marriott International Inc) biggest association this year is a full-blown fashion show by Abu Jani Sandeep Khosla. They’re all set to unveil the season’s latest bridal collection in association with ‘Shaadi by Marriott’, on 21st July at JW Marriott in Delhi. The collection is inspired by the wonders of nature, the elegance of Paris, and the rose-tinted dream weddings brought to reality by ‘Shaadi by Marriott’. 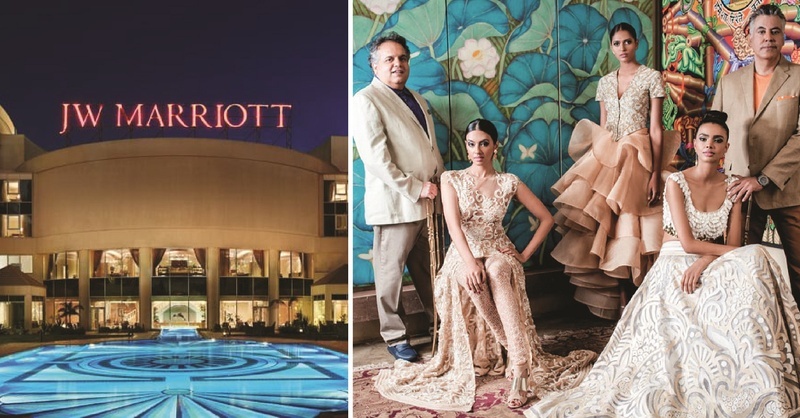 For both Marriott and Abu Jani Sandeep Khosla, every event must stand out and apart. We have specially curated a 5-part fashion sequence that will bring alive the traditions and majesty of an Indian wedding. Each part beautifully represents an Indian Wedding ceremony, right from Mehendi and Haldi, to the cocktail and sangeet, ending with the Shaadi. So basically, it is an entire wedding unfolding right before you. Great. So Khushnooma, now that we know all about the show, let’s come to you. Reaching the position of South Asia’s marketing head for Marriott is no easy feat. How has your journey been so far? KK: My entire experience with Marriott has been a long one; I’ve been with them for over a decade now. Of course, I didn’t start out with where I am today. Started off being the marketing manager for this property (JW Marriott Mumbai, Juhu) and lots of years of commitment has brought me to where I am today (Area Director of Marketing, South Asia, Marriott International). No journey is without its hurdles. With that being said, I did face my fair share of twists and turns but it’s all been good in terms of growth and because of Marriott’s brilliant work culture that’s helped me get here. I’d say a lot of what I am today - professional and personal - is what Marriott has made me. Hearing all of that and more, we were super-inspired by all that Khushnooma is! To conclude, we have one last question. What’s your advice for women with an ambition, like yours? KK: One advice I’d like to give women out there is that we’ll always face challenges, failures - I did as well. But the one single force that drives me never allows me to give up. Life is all about challenges - live up to the choices that you make. If you decide that staying home with the kids is something you enjoy doing then by all means do it. And if you think going out and building career is for you, go after that. But whatever you do, do it without being bitter about it. Because, it’s not about sacrificing, it’s about enhancing your life and the ones that you touch. That for sure, is some great advice for us, for you and for every girl out there looking to make something of her life. Coming back to the highlight of this article - we for one are super-excited about the show! Stay tuned for an update!